These are the best wireless Bluetooth headphones: on-ear, over-ear, in-ear buds and any other ways brands come up with to get sound into your ears. Ever since phones started losing their headphone sockets, wireless buds and headphones have taken a leap from being a niche, to the portable audio norm. Nowadays the best wireless headphones are more sought after than the best wired headphones. And as consumers are demanding folk, Bluetooth audio sound quality has gone from frankly rubbish to, often, pretty near to wired audio quality. Connectivity has also greatly improved, so your music doesn't keep cutting out. That's not the only change in the headphone market in recent years. Active noise cancelling has also gone from being a smaller niche to make up the biggest chunk of the headphone market, at least in terms of value, if not units sold (they are pricey things). However, if you don't want top-notch noise cancelling, it's no longer necessary to spend big money to get the best wireless headphones and buds action. Although admittedly, if you're demanding about what you listen to, you will have to pay more to get the best results. What are the best Bluetooth headphones and earbuds? If you favour the larger headphone, I'd say the best on-ears are AKG's Y50BT and the best over-ears are Marshall Monitor if you prefer a more rockin' sound, or Audio-Technica's ATH-M50XBT if you favour a more neutral tone. For in-ears, I recommend either the Optoma Nuforce Be Sport4, which is great value or the pricier Sennheiser Momentum Free. If you like the 'necklace' style of headphone, try SoundMagic's excellent E11BT. The only example of a wireless in-ear monitor I've come across is Flare's extraordinary Flares Pro – an IEM that plugs into a small external DAC. We've got an entire list dedicated to these, as the best ones do tend to be more expensive, and attract a different type of customer (people who fly a lot, for instance). Most of these are wireless nowadays although there are some wired options such as the Bose QuietComfort 25, which can often be found going cheap. My favourites are probably, by a narrow margin, the Sony WH-1000XM3, which has possibly the best noise cancelling of the lot, and also the most musically rewarding audio. However, rivals from Bowers & Wilkins, Bose and Beats all run it extremely close – as does the older Sony WH-1000Xm2, which can also sometimes be picked up much cheaper, for obvious reasons. Also known as 'Apple AirPods and Apple AirPod rivals', true wireless are in-ear buds with no wires whatsoever, whereas traditional Bluetooth buds are joined by a single wire, with a remote control and battery/charging port mounted along its length. Again, these have their own best buys chart for you to peruse, because they are quite a different proposition to 'traditional' wireless headphones. The best you can get are Jabra's Elite 65t for its mix of secure fit, very good audio and gym-friendliness. Apple AirPods are omnipresent, at least in London, because they too are excellent, especially if you pair them with an iPhone (as Apple would expect you to do). If you want the absolute best audio quality, you'll still have to get wired headphones, but Bluetooth cans are now far better than they were at providing great sound. • What is aptX and what is AAC? Without getting mired in too much technical detail, these 'codecs' allow for higher-resolution music playback than standard Bluetooth (sometimes referred to as SBC, although seldom by members of the general public). Apple iOS products support AAC and most Android mobile devices support Qualcomm's aptX. The most important thing to remember is this, readers. Do you use an iPhone or iPad for music? Then aptX is useless to you, no matter how big the logo is on the headphones box. You need AAC compatibility. Mystifyingly, despite many iPhone owners being music fans with lots of disposable income, an awful lot of quite premium audio brands seem to have absolutely no idea what AAC even is. If you have an Android phone, most likely it supports aptX, so dive right in. There's also aptX HD, which claims to offer better than CD quality sound but is not very widely supported as yet. And aptX Low Latency, which is for watching films wirelessly (Bluetooth can otherwise introduce lag that makes for lip-synch issues akin to watching a 1970s, dubbed kung-fu movie). Although they won't usually support it out of the box, you can force both Windows and Apple laptops to support aptX. I have no idea why this is as unnecessarily hard as it is, but it there we go. But trust me, it can be done. In general, on most headphones, audio sent via either aptX or AAC sounds better than when sent without. It's not totally cut and dried: I've heard certain headphones (and Bluetooth speakers) that just use the standard SBC Bluetooth format, that sound better than certain other ones with AptX and AAC. They're not a magic formula for great audio on their own, but on average, they tend to sound better. Although aptX and AAC offer sound quality roughly the same as CD, obviously that only applies if your source is putting out CD quality (or better) audio in the first place. • Bluetooth headphones: what else do you need to know? Bluetooth cans today are generally far more stable in terms of connection than they were just a few years ago, and battery life has improved, too. As well as a norm of 4-5 hours for true wireless, 8-10 hours for in-ear buds and easily 20+ on over-ears and on-ears, a lot of newer headphones also charge rapidly, giving you several hours of playback for 15-30 minutes of charge. If you keep your phone in your hip pocket, and especially if you then contort your body by looking around you, you may find the signal still cuts out as your bones and guts are very adept at blocking radio signals. However, from your hand, a breast pocket, placed on a desk or in one of those weird arm holster things for runners, you should rarely get any interference from these headphones. You can usually walk between 20-30 metres away from wherever the sound is coming from, although you generally can't leave the building and expect to still receive audio. Why would you do that anyway? I recommend paying a bit more – £100/$100 to £300/$300 – to get the kind of over-ear, wireless headphones that'll give pleasure for years. However, particularly if you prefer in-ears, you can get very solid Bluetooth headphones for a lot less. These have been around for years, but I recently dug them out again and was rather amazed at how good they sound. AKG's wireless headphone version of its celebrated Y50 was ahead of its time in terms of the reliability of its Bluetooth connection, and they really nailed the sound as well. They're quite bassy enough, but don't push the bottom end to the detriment of the mids and treble. Lightweight and attractive, they do pinch on your specs a bit if you're a glasses wearer but that unfortunate trait is common to practically all on-ear (as opposed to over-ear) headphones. Due to their age, the Y50BT can be had for a much more reasonable price, these days. Depending on what the current best deal is, they could be described as the best wireless headphones under £150 or the best under £100. While the AKG cans above are reliable old stagers that have been around a few years but still sound great, the BE Live5 from Optoma's headphone division is brand new. These new arrivals are very similar to the BE Sport 4 immediately below but with the emphasis more firmly on sound quality – BE Sport4 are a great-sounding pair of gym buds, but these are more, for want of a better word, 'musical'. The fit is actually quite similar to its sportier sibling, with a choice of tips and optional hooks to keep the buds in place, and there is also IPX5 water resistance, but these are much less suitable for workouts because the way they sit in your ear is more about comfort than security, and also because they're noticeably larger. Most of the headphones atop this list could be described as being best for using on the streets or on the bus, and present a big, bassy, upbeat performance. That's because outdoors is where Bluetooth comes into its own, in my opinion. However we're now talking about cans that, while wireless, have a more 'traditional', dare I say 'hi-fi' sound, designed for long-term listening outdoors, indoors and while travelling. That's certainly true of these excellent over-ear cans from Japan's top headphone experts Audio-Technica. They can be a bit funny to pair and very occasionally lose connection when you're out and about, but it's easy to forgive those technological foibles because the ATH-M50XBT sounds so damn good. I don't think they're excessively 'audiophile' in tone either – the bass is definitely hyped a bit, and the result is very pleasing. Another bonus is that the battery lasts for 40 hours – almost long enough for a Pink Floyd box set. They're also comfortable enough for that kind of duration, although your ears may get a tad warm during summer listening sessions. The build quality maybe doesn't suggest decades of use to come, but it's not overtly flimsy either. SoundMagic E11 is easily the best sub-£50 pair of earbuds you can buy and SoundMagic E11BT now repeats the trick for wireless earbuds under £70. They're as good as Bluetooth buds costing twice as much. I'm generally not a big fan of this 'necklace' style of headphone, with the thickened central section that goes around your neck, with the electronics housed in two little pods at either end of it. However, this is better designed and more comfortable and stable than any other headphone of this type that I've tried. Audio is amazingly good for the price, connectivity is rock solid and the fit is comfortable, simple but sufficiently secure for most activities shot of running on bumpy ground. As with the same brand's wired buds, build quality also appears way above what you'd expect at this price. How does SoundMagic do it? These are a surprise package because, being designed specifically for gym and running, you'd think they wouldn't necessarily sound very good. But you would be incorrect in that assumption. That's because not only do the BE Sport4 have all the usual virtues of the best running headphones – water and sweat resistance, a secure but comfortable fit, not too pricey – they're also sound easily good enough to use outside of workout duties. They're very musical with well-weighted bass and excellent noise isolation because of the secure fit. Audio quality is further helped by support for both AptX (for Android) and AAC (for iOS). The battery life of 10 hours obviously can't compare with the big over-ear cans in this list, but it's not bad at all. Connectivity is also very solid, although they do have one major quirk: they take about 10 seconds to connect to your phone. That's really their only major flaw, and pretty forgivable given the price. I've been using these for over a year now, and keep coming back to them despite having vastly more costly headphones at my disposal. Although they take a little longer to pair and perhaps sound slightly less excellent than the Sport4, the older Optoma BE Sport3 are still worth considering, because they can often be found going very cheap indeed. Marshall headphones always seem to attract slightly half-hearted praise from audio reviewers, because their sound is not what you could call neutral, and they're not made in the same factories as Marshall's legendary guitar amps. Well of course they're bloody not. For sure, the sound is pretty bassy and puts a premium on making the music sound exciting and rocky, rather than how it would sound through a pair of audiophile, uncoloured headphones. However, they're not as bad as Beats' older headphones in those respects and to my ears, I must admit that they generally sound fantastic. They're near perfect headphones for rock, hip-hop and electronica, but that is not to say that they render anything more delicate than Slayer unlistenable. The Monitor Bluetooth sits at the top of the Marshall range, although discounting means it can ofter be had for around £150 (RRP is over £200). They are attractive, sound great, and are more comfortable than the cheaper Marshall headphones, although glasses wearers may still find they become a bit testing after prolonged use. They score bonus points for the very long battery life, and the simple and effective, 'joystick' control for volume and track selection. My usual position with Bluetooth headphones is, yes, great for convenience but the sound is never as good as wired headphones, although they have been steadily improving in the last couple of years. Well, no longer! 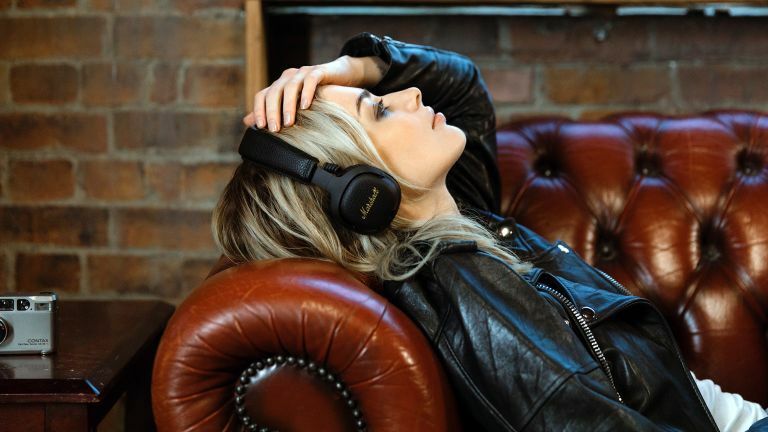 Flares Pro might look like they've been knocked up in a shed by a keen amateur electrician, but they're comfortably the best Bluetooth headphones I've heard. That's especially true with Apt-X compatible players and hi-res files, but even when used to listen to MP3 from an iPhone, audio is a revelation. That's because the comfortable, minimalist buds are actually attached to an external wireless DAC. This does a fantastic job of wringing the most out of your digital music. However, for reasons known only to Flare, the cord it's on is so short that you have to clip it to your lapel, like a policeman's walkie-talkie. If you can put up with that sartorial no-no, I wholeheartedly recommend the Flares Pro. Admittedly, they are also a touch expensive compared to most in-ear Bluetooth headphones, but the size of the sound stage, plus the impeccable clarity and quality of the audio more than justifies what you pay. The only thing I can really think of to compare it to is Ifi's superb xDSD Bluetooth portable DAC, plugged into a pair of decent IEMs – and that will set you back the best part of 600 quid, in all. The Flares Pro serve up real stereo rather than the channel-blurring mush of most wireless cans, and bass is taut and engaging without overwhelming the middle and upper registers. From electronic dance music to delicate classical, everything sounds like what you'd expect from comparably priced, wired headphones. For Bluetooth, it's mind blowing. Connectivity seems rock solid, too. Curiously, you can also disconnect the buds from the Bluetooth DAC and plug the ends into a supplied cable running to a 3.5mm jack, and use them as wired headphones. From a phone, they actually sound worse in this form, but use a music player or headphone DAC and results again veer back toward mind-blowing. Other than the odd design, my only reservation with these is that even with the choice of approximately 9 billion silicone and memory foam tips provided, it's hard to make them stay in place during a run or cycle. So, I guess, don't wear them while running or cycling would be my advice (use some of these instead) – the Flares Pros are headphones to be savoured at leisure, anyway. One significant minus point for some will be the absence of AAC compatibility, for getting the best possible Bluetooth sound out of an iOS device. When you're trying so hard to make an 'audiophile' wireless product, it almost beggars belief that you'd leave it out, from a marketing perspective, though I can confirm the Flares Pro still sounds excellent when using an iPhone. The presence of aptX means it tends to sound even better from compatible Android devices, though. Sennheiser finally took my advice and made some wireless buds that don't have a necklace design (the old Sennheiser Momentum In Ear Wireless is reviewed down below). Get in! The results are all you'd expect from Sennheiser, with boring yet slightly odd styling being outweighed by excellent sonics and decent attention to technical detail. Audio is as good as you'll find on wired headphones of similar price and if the battery life of six hours isn't exceptional, the highly reliable connectivity and inclusion of Bluetooth 4.2, AAC and Apt-X make that easier to live with. With rock, pop hip-hop and electronic music, Sennheiser's 'signature Momentum sound' is relentlessly involving, punchy and listenable. It's hardly the most transparent or neutral of performances but so what? Unlike some pop-oriented cans it does make a very decent fist of rendering acoustic sounds and the human voice. The design is a bit odd, as usually seem to be the case with Sennheiser these days. The cable is way longer than it needs to be, and the battery and remote give it a bit more weight than you'd expect, given the battery life is only six hours. The included ear tips are also a bit old fashioned – they're smooth silicon, with no spongey ones, and no option to add Bose/Monster/Nuforce-style 'hooks' for better anchoring. I actually popped mine off and replaced with a pair of Comply tips, after which I got much better fit which also meant I was consistently hearing the Momentum Free at its best. The P5 Wireless has always sounded great but I found at launch that it just would not stay properly connected via Bluetooth. I tried using it wired (a cable is supplied) but eventually gave up and moved on to the next pair of cans. However, revisiting them recently with a new phone, I found connectivity much improved. It's not possible to update the firmware on the P5 Wireless, and I think we can safely assume they haven't magically fixed themselves, so I assume newer versions of Bluetooth, or other wireless transmission improvements in newer devices, have alleviated the connectivity flaws of yore. That's bloody good news, because the P5 Wireless still sound fantastic, as most B&W cans generally do. Audio is purposeful and deftly delivered, with both power and complexity on tap. They're also quite stylish, if rather rectangular, and the fit is fairly comfortable by on-ear standards although glasses wearers in particular are still likely to feel a bit 'pinched' with long-term wear. These are a touch more expensive than most of the options here, but they are future-proofed and audiophile-friendly, with the addition of 'better than CD quality' aptX HD (as well as the currently more commonplace aptX and AAC codecs, which are about the same as CD quality). The DSR9BT employs a fully digital drive system with no digital to analogue conversion. For that reason, there's no analogue, wired option but you can attach to compatible equipment – laptops, for instance – with a USB-C cable. What's the sound like? Not surprisingly, it sounds very 'digital'; accurate, rhythmically sure-footed and able to go very loud, but maybe a bit on the cold side, for me. They're good looking and reassuringly expensive-feeling cans, although the volume and pause/play controls are as bad as any I've ever encountered. The volume slider is hard to locate and feels clonky, and it's much too near the ridiculous touch sensor that Audio-Technica has seen fit to employ here. There is something ever so new-agey and ravey about these headphones and that's reflected in both their bizarre design, their marketing, and their excellent reproduction of banging dance choons. Actually, Nurafone sound great with all sorts of music but the amount of bass available definitely makes them most suited to those who like to 'have it large' whilst 'getting on one'. As you probably know if you have used Facebook or been to any website that has adverts on it in the past year, Nuraphone claims to adapt to your hearing, to give 'magical' results that will make you weep tears of joy. Yeesh. Do me a favour. It's impossible to prove or disprove the validity of Nuraphone's claims. Although I can say with some certainty that with the adaptive setting turned off, they sound like crap. With it turned on, I did not weep tears of joy, but I found them highly enjoyable to listen to. This was especially true, I found, with early 90s jungle, deep and glitchy electronica from the likes of Autechre, 70s reggae, and dance-influenced rock from the likes of The Clash and LCD Soundsystem. Essentially I came to try Nuraphone with a great deal of cynicism, but they do sound good. Also, despite looking like something from an HR Giger sketch – with their bizarre, combined in-ear/over-ear design, they both smother and penetrate – they're not uncomfortable by any means. On the other hand, they do cost quite a lot, and the 'Immersion' setting, which makes the headphones vibrate when turned right up, is preposterous. Still, good to see someone doing something different in the headphones field. Marshall has taken a similar approach to Beats with its headphones: distinctive look, tuned sound. It's done it better, at least to my ears. This pair takes the rockin' sound of the Major II Wireless and adds better audio – Apt-X is supported this time – better padding on the ear cups, and notably less ropey build quality. It also tones down the novelty of the design, although the faux leather look is still clearly not going to appeal to everyone. What makes the Mid such a winner – for me, at any rate; I know these things are subjective – is that the audio is bloody great… if you play it loud like a mother. WOAH YEAAH! The Mid has power, but it also has a decent dollop of precision. There's plenty of bass, but not to an obnoxious degree. With rock, anything electronic and hip-hop/R&B, it does a cracking job. Same with pop and heavier classical. I wouldn't buy a Mid to listen solely to light jazz – or anything quiet in fact. However, unlike the Major II, the Mid does at least make a half decent fist of playing more subtle sounds. The battery life is a little shorter than the Major II, presumably due to larger drivers and introducing the Apt-X connection… But it's still 20+ hours, so hardly to be sniffed at. The one criticism I have is that they are on the tight side, to the extent that wearing them with glasses verges on painful. Presumably they will loosen over time, but people who wear specs (or have large heads) should look elsewhere. There is also now a version of the Mid with active noise cancelling. It is called, logically enough, Marshall Mid ANC. It sounds exactly as good as the standard Mid, and while the noise cancelling is not on par with the likes of Bose, Sony and Bowers & Wilkins, it does shut out enough extra ambient sound to make the listening experience even more enjoyable.